Thank you so much for reading. Have a great weekend. Beautiful! I love the cute skirt! Fantastic skirt and bag! You look so feminine and chic! I love that skirt and how you style it! So pretty! Hope you have a great weekend, Jade! So classy and elegant! That shirt is so pretty! I love this skirt! It looks floral, but in a watercolor sort of way. So pretty! Such a pretty skirt, love it! You're one of my top 5 favorite bloggers because your style makes me so happy! You always have fun colors and pretty things! This look is making me so jealous for spring weather! I just love this floral skirt!! 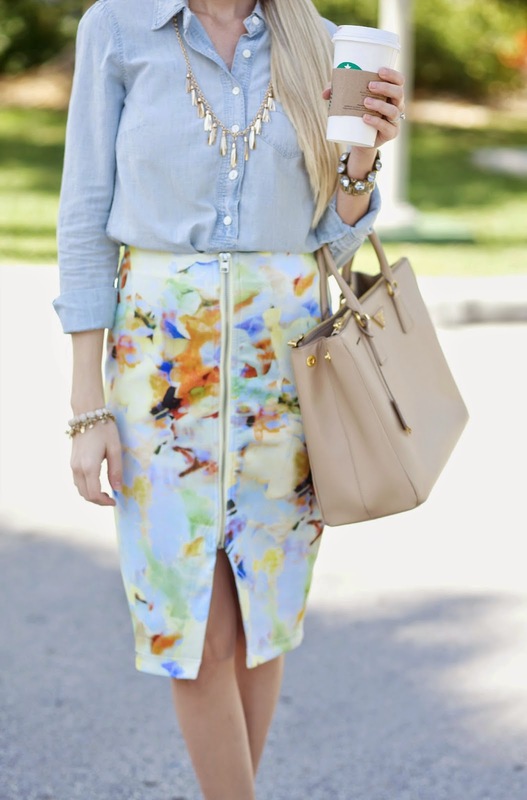 Love this skirt and how you styled it with the chambray shirt! This is such a perfect skirt for springtime! I'm always looking for more professional dress (as a pre-service teacher!) and it's so hard to find things that still showcase my personality! This is absolutely perfect-the skirt is long enough to wear while teaching & the chambray looks so comfy but yet polished! Wow! That skirt so pretty! Love how you styled it. You look amazing!! I can't believe you just had a sweet little one. What is your secret? Happy Weekend! I'm adoring this outfit! That is such a cute skirt for spring! Such a gorgeous spring time look! The print on this skirt is gorgeous! This whole look makes me excited for spring. This outfit is pure perfection!! I have this shirt and it is so comfy...looks amazing with the skirt!! Finally it's starting to warm up, and I love this spring look you put together! That skirt is just gorgeous on you!! Beautifully effortless spring look! I love the fun, floral printed skirt. This is so cute!! I love this skirt. Such a great look on you! I love that the floral skirt has an exposed zipper - keeps it from being too over the top girlie.